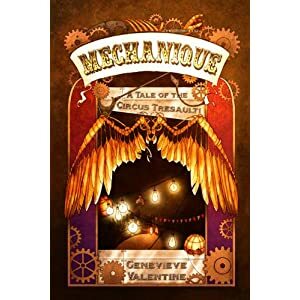 I just finished reading Genevieve Valentine’s glorious novel Mechanique: A Tale of the Circus Tresaulti, and HOLY HECK. That novel knocked me out, down and sideways. Now, I’ll write more about it when we get closer to its release date (in May, I believe. I got to read it early because I am SOOPER SPESHAL), but in the meantime, take a look at that gorgeous cover. Then, hop over to Amazon and order you up a copy of your own. Seriously, you’ll thank me for it. And, you’re welcome. Lucky you for getting an advance copy! This is going on my to-read list. YES! It really was phenomenal – searing and lovely with a deft, wry touch. Really an incredible read. We left frozen hotdishes and flowers in pots and sliced ham on the porch when the Taxidermist refused to open the door. hot-dishes. The Taxidermist’s Other Wifeby Kelly Barnhill Dear Cheryl and Neil, I’m not sure who should receive this, now that Sean is no longer editing fiction, and so I’ll address you both. First, before getting down to the nuts and bolts, this is the best fiction I have read at Clarkesworld. If I have time, I’ll post something in comments later. I really enjoyed the author’s use of our language. And, the juxtaposition of taxidermy, with the dying of the American heartland, is simply brilliant. Here are a few nits. “It is, they believe, the first indication that the art of specimen preservation is not a modern passtime as previously thought. Should be pastime. The school yard is packed earth with a single metal swingset for the children to play on. Should be schoolyard. I wonder if the Carthagian priests thought to recreate the minutia of the mundane as we do now. Carthaginians. They spent their day off home and in bed—this is cumbersome and stops the eye. Should be— They spent their day off at home in bed. No one locks their doors. Their is not needed. the farther we are from the divine—should be further. Finally, my pet peeve. The use of the words used to, to connote the past. She walks from their house at the center of town, past what used to be once was the butcher shop and what used to be was the hardware store and what used to be was the Shoe Emporium and what used to be was the offices of our former newspaper, (I put the comma there) until she reaches her husband’s office at the Town Hall. She wears high heels, even in winter,( no comma) that click coldly against the cracked sidewalk. She doesn’t trip. She doesn’t break stride. She wears a skirt that skims her young thighs and flares slightly at her bending knees. She used to (often or sometimes smiled) smile at us when she passed, but she doesn’t anymore. We never smiled back. Instead, she keeps her lovely face porcelain-still, her mouth like a rosebud in a bowl of milk. A doll’s mouth. Of course, if the author wishes to use—used to—there is nothing grammatically incorrect. And, if used as a part of dialogue, the usage is fine. However, I doubt you’ll find used to or used to be, in a major publication. No ironclad rule, you understand, just a peeve of mine, but I think the paragraph reads better my way. The author may say, “but it sets a tone or is “folksy” and fits with the character of the piece.” It does not. The language in the piece is wonderful, and this paragraph sticks out like a sore thumb. The editor should stick to his or her guns with this. One other thing, there are a number of comma errors. It’s minutia, and so I won’t get into it. But this piece deserves a better edit. Neil hates it when I edit his edits. And so I do it as much as I can. But you’re the first author I’ve tried to contact directly because I really enjoyed the piece, and would hope it would be picked up by anthologies. P.S. sorry to contact you this way but I didn’t have an emial address. Huh. I thought my email was on the About Me button. Must fix. 1. Hotdish. If you were born and raised in Minnesota (as I was) you would understand that hotdish is one word. It is on our menus, in our schools and in our cookbooks. There is an entire classification for “hotdish” in every potluck in the tri-state area. It is as close to our souls as mother’s milk. It is the archetype of food. I would sooner grow a third leg than hyphenate hotdish. 2. “used to” – This may not actually be correct, but it is an absolute Midwesternism that is crucial to establishing the voice of the piece. You go to any dying town in the midwest, and “used to” is the dominant phrase. So I would defend it with my last breath. And I get it that non-midwesterners (or midwesterners who are actively distancing themselves from their roots) might find it grating, but I don’t care. Since the piece is told in the collective voice, the oddities of speech need to remain. And really, I’m very touched that you took the time to wrestle with the text. I don’t know about you, but I tend to simply ignore the things I hate, and only expect the best from the things that I love. And not just with stories. So, thank you. Honestly, it means a lot. And sorry about the formatting taken from the email to Clarkesworld, but I just didn’t have the time. You get my drift though? And thanks for that too! It was a lovely day. I’m from Ohio (that’s spelled Ah hi ah.) So I’m used to hearing it. Hotdish must be another colloquialism, it just hasn’t trickled down to us yit. I like to edit Neil’s edits at Clarkesworld. He will change any misspellings that I point out, but is terribly defensive when it comes to changing a sentence structure or punctuation. In fact he simply won’t do it, even though it’s apparent that the sentence is incorrect or the punctuation dubious. That being said, I seldom try to contact an author and advise them of the changes I would suggest. But I really like the story and would hate to see it picked up in an anthology with nits hanging on. Something bad is happening in our language, and it has to do with the proliferation of SF that’s being published on the net. Although, I do agree with you about using comfortable language in letters, emails, twits etc. I must respectfully disagree when writing for publication, for profit; the public deserves our best—that includes best writing and editing. Unfortunately, the many zines out there do not have professional editors, it’s not their faults; they simply can’t afford to put an editor on staff. As the process of weeding out those less desirable SF zines continues, I’m afraid more and more folks will take comfortable shortcuts in language usage. Imagine using a made up noun—hotdishes, or a colloquialism (without notation)—like “used to” in the Atlantic Monthly. I don’t think so. And yet, I see it time and time again in SF circles. Pardon me while I move my soapbox over against the laptop. It’s probably not fair to say “used to” is a colloquialism because the phrase is so widely used. Some dictionaries are okay with using “used to” as a past tense verb with no subject. So there is nothing wrong with its use. But when writing I almost always use “use” as an adjective—used tractor, used airplane, used laptop. Less confusion. Well, got to get back to the grind.